DETROIT – A fundraising project launched three years ago by descendants with a “living bond” linking them to old Keghi in Turkish-occupied Western Armenia will be capped with a Keghi III “pagharch” feast in December to benefit school children of Nor Keghi in the free Republic of Armenia. In doing so the life of students and residents in the Nor Keghi village of independent Armenia will benefit with the renovation and development of a multi-purpose auditorium at one of three existing school structures. Activist Richard Norsigian, a motivating project member who conferred with officials in Nor Keghi in September, said school and government leaders were elated on the enhancement project launched by the Nor Keghi Association of Greater Detroit. With the cooperation of the Ministry of the Diaspora, Norsigian, chairman of the association’s steering committee, was also greeted at a Town Hall meeting in Nor Keghi, a community numbering more than 6,500 residents near the capital city of Yerevan. 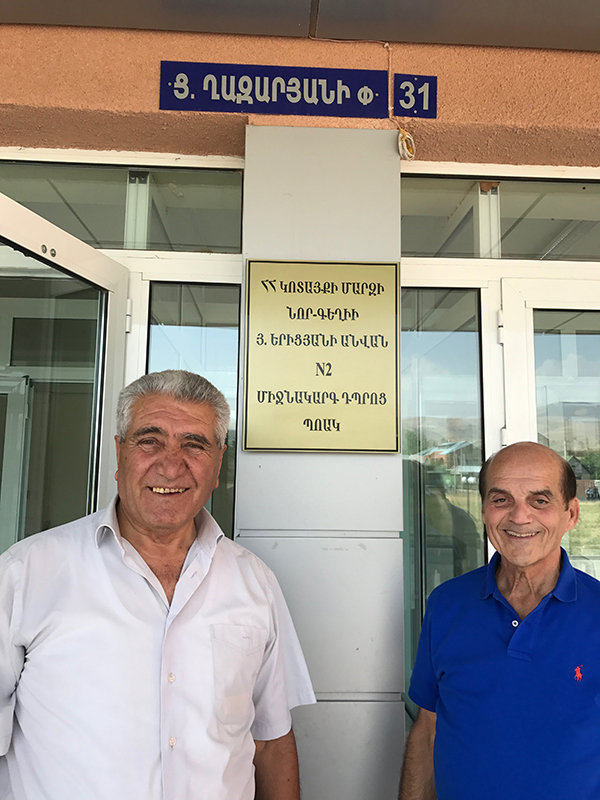 Nor Keghi Mayor Ashot Tevosyan escorted Norsigian on a tour of the town and two of its most recently built schools that service a full 12-grade education format. At the third school Norsigian said it was evident there was a need for renovations in its auditorium. “By concentrating on upgrading the multi-purpose auditorium to benefit students and the community our mission will foster a living bond between the DNA of old Keghi and Nor Keghi,” said Norsigian, a retired public school administrator and professor at Madonna University. This year’s fundraising will take place on Saturday, December 2, at 6:30 pm, at St. John Armenian Church Hall in suburban Southfield. In addition to dining on “pagharch,” a winter meal consumed by Keghitzees for centuries, a full menu also will be served – followed by Armenian folk dance music by an all-star band consisting of noted Armenian musicians. In addition to being taken on a tour of Nor Keghi landmarks, Mayor Tevosian took Norsigian to the St. Hovhannes Church, the first church built in the community after its renaming in 1962 from Ashdarag to Nor Keghi by the Armenian government. At the church Norsigian and his son Shant dined with community leaders and school principals where their hosts also applauded Detroit’s Keghitzees for reaching out to Nor Keghi. In addressing the gathering the mayor said “we are pleased and elated to have compatriots in America who are concerned about our homeland and particularly Nor Keghi.” Norsigian said Nor Keghi is also the base of impressive plum and apple orchards that help strengthen its economic base by reaching out to markets in Russia and Ukraine. Attendees to the Nor Keghi event can also learn more about the continuing role of Houshamadyan, a non-profit association to reconstruct and preserve the memory of Armenian life in the Ottoman Empire. Founded in 2010 in Berlin, Germany, its USA branch was organized earlier this year in Michigan. An informational booth will be stationed at the December 2 event to fully introduce the project, answer questions and digitize up to three memory items if people would like to bring them, and to set appointments to digitize larger collections. Ani Kasparian, an Armenian language lecturer and instructor at the University of Michigan-Dearborn, said the Houshamadyan Education Society seeks to cover all aspects of the history of Armenian life in the Ottoman era, including social history and daily life – from music, literature and material culture. Of interest would be musical recordings, photographs, pictures, books, periodicals and old film history. Additional information can be obtained on its website : www.houshamadyan.org. In reviewing the upcoming Nor Keghi pagharch fundraiser, Norsigian stressed “we will dine on a staple that helped our ancestors survive during the freezing winter seasons in mountainous Keghi, while emphazing that by meeting our fundraising goal we will enhance the life of our fellow Hyes in Nor Keghi – especially the school children.” From its very beginning the project has been embraced by the entire Detroit Armenian community. A donation of $45 per person covers the event’s traditional “pagharch” feast along with a full buffet menu and Armenian dance music.